​2015 Update: This year's Common Ground 2015 Art Biennial Trip to Cuba will feature The Art of Fire Project! The Art of Fire Project (Proyecto Arte del Fuego) was a ceramic residency project bringing together professional clay artists from Cuba, the US, Canada, Europe and Central and South America. The project ran from 2002-2008. The project artists were cultural ambassadors sharing artistic techniques and ideas. The program's goals were to : 1) Promote Peace and Friendship through the universal language of art; 2) Place technical expertise at the service of art in order to provide a working environment that facilitated the creative process; and 3) generate educational programs that would reach out to sectors of the community often excluded from the mainstream. There were a number of exhibits and residency programs during the six years of the program. The culminating exhibit for the project was at the Fullercraft in Massachutes in 2009. There is still Cuban artwork for sale from this project. "G vs. E" by Paul Andrew Wandless is part of "Beyond the Embargo: Cuban and American Ceramics" at Fuller Craft Museum. BROCKTON - In all of Cuba, there is not a single ceramic supply store. So says Catherine Merrill, curator of “Beyond the Embargo: Cuban and American Ceramics’’ at the Fuller Craft Museum, a show as intriguing for its story as it is for its art. Rather than buying clay, Merrill said in an interview, artists visit mines. “I’ve heard stories of midnight raids,’’ she said. If “Beyond the Embargo’’ is any indication, Cuban ceramicists are thriving, despite dramatic economic disadvantages. They stage regular encuentras (Spanish for encounters), where clay artists from around the world gather, share technical expertise, and collectively stoke the creative flame. “Foreign artists will bring brushes and glazes and chemicals,’’ Merrill explained. But they still work on Cuban potters wheels jiggered from auto parts, and use local glazes mixed from pulverized stones, ground up television tubes, car batteries, and eggshells. The US trade embargo hasn’t helped the situation. Travel restrictions tightened during the Bush administration have made it tough for Americans to attend the encuentras. But there are loopholes. Merrill, for instance, has been granted visas for research projects. Likewise, it’s not easy for Cuban artists to visit the United States. Merrill invited Cuban Antonio Lewis to speak on a panel in California in 2003, and he was declined on the grounds that he was “a specialist in ceramic technology in all its applications,’’ according to Merrill. The Obama administration has eased some economic and travel restrictions on Cuba. In this show, all the Cuban work is smallish, because it was carried here in suitcases. Merrill and several other American and Cuban ceramicists formed Proyecto Arte del Fuego (Art of Fire Project, www.artoffire.org) to promote cultural exchange between the two countries. “Beyond the Embargo’’ is the fruit of that organization. The group runs the gamut from young artists still finding their way to established artists, and includes Cuban heavy hitters Osmany Betancourt, Nelson DomÃ­nguez, and Alberto Lescay. DomÃ­nguez, a jack-of-all-mediums, is a painter and printmaker as well as a ceramicist. Here, he offers one of his favorite motifs in “Untitled (Clothespin),’’ an oversize terra cotta pin with a person etched into either side. The two tensile figures are caught in an awkward embrace. With the curling force of the pin’s fastener, it’s deliciously unclear whether they’re trapped together, nose to nose, or lovingly ensconced. Lescay is likewise multitalented, recognized as a sculptor, public artist, and painter. His terrific “Creo en la Tierra Diptych’’ features two rugged stoneware spheres, crackling with a reddish glaze. They look like giant balls of soil. One has a puckering seam; the other tears open to reveal a nest with porcelain eggs inside, perfect, white, and hopeful within these weathered looking orbs. A ceramic artist on the rise, Betancourt has crafted a satirical bust “Rostro de mi Ciudad (The Face of My City),’’ which began as a rough self-portrait in terra cotta. He stretched it sideways, twisting the ears into corkscrews. Eyes and mouth squeeze defiantly shut. The base is coal-gray, the head highlighted with a ghostly pale white. It’s a picture of fatuous resistance, reminiscent of the darkly comic social commentary of artists such as George Grosz and William Kentridge. “Beyond the Embargo’’ spotlights nine Cuban artists and six Americans. By and large, the Cuban work has more edge and more pathos. JosÃ© Vasquez XÃ©ne’s fearsome “Las Mujeres’’ is made up of five rectangular stoneware plates. The central one is really a box, housing a clay heart that appears bloodied. The others frame it, each a grid containing female figures, some bound, one sliced open. There’s a strong surrealist tone in Cuban art, indeed in much Caribbean art. It likely has its roots in the region’s Santeria religion, which melds elements of Yoruba, Roman Catholicism, and indigenous beliefs. Raul Miranda’s fantastical earthenware “Intercambio’’ has a nightmarish quality: An elongated torso on three plump, truncated legs appears to open and reveal a chaos of figures and structures - people, animals, wheels, ladders. A roof tops off the head. The Americans’ work is more lighthearted. Joel Bennett’s “Udu you Love - La Isla’’ is a vessel made in the heart shape of Isla de la Juventud (Isle of Youth), where one of the encuentras was held. Rather than use a glaze, Bennett fired the form in a sandpit, where seaweed and sawdust contributed to its dappled tone, dove-gray with dashes of bright color. The piece is modeled on the African udu drum. Merrill’s tall, playful vases feature lolling women drawn from life, against a lush, warm ground like the sun rising. Boston artist Janna Longacre’s assemblages are only partly ceramic. Her taut little piece “Protect Them’’ features tiny shards of porcelain, like bits of eggshell, on a square clay plate that has been wrapped in black wire and nested in a length of plastic rope. Paul Andrew Wandless doesn’t let on who the initials in his clay monotype “G vs. E’’ refer to. 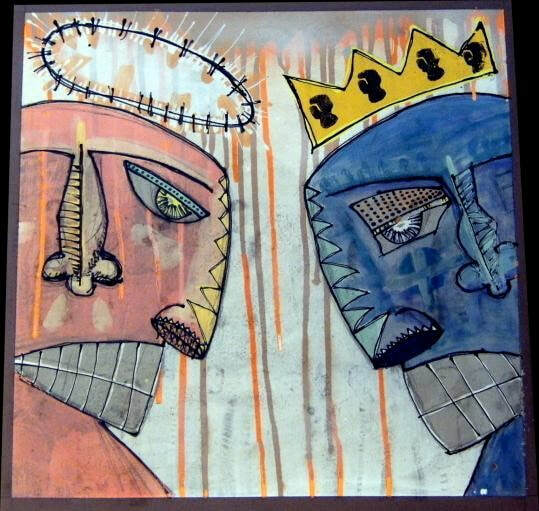 The work depicts two fierce fellows head to head in a teeth-baring standoff. In this context, they could be Fidel Castro (and now Raul Castro) and the parade of American leaders of the last 50 years. It’s a sardonic piece, bristling with strong lines and lurid tones. “Beyond the Embargo’’ stretches hands across the political chasm between the two countries. While the leaders partake in a political dance, pushing away and then taking small steps toward each other, the artists come together and party.